A century after their ancestors fled mass killings in Ottoman Turkey, Armenian communities are again on the move - amid fears they could become victims of violence in Syria. The latest composition by musician Sarkis Atamian is haunting, combining melancholic Middle Eastern melodies and ancient Armenian folk instruments. It is an emotional homage to his hometown, Aleppo - which he has fled because of the heavy fighting. The musical mix reflects Mr Atamian's own background: he is ethnically Armenian. But for generations his family has lived in Syria. Many Armenians are now finding their lives in Syria untenable - alarmed by the on-going war, and terrified of what may come next. 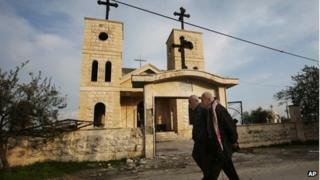 As Christians, some fear for their futures if Islamist rebels take control. President Bashar al-Assad, and his father before him, have traditionally been tolerant towards non-Muslim minorities. "The good thing here in Armenia is that you know the language, the alphabet, the religion," says Mr Atamian, as he sips aniseed-flavoured tea in one of the new Syrian-Armenian restaurants, which have been opened in Armenia's capital Yerevan by people fleeing the war. "When I came here, I thought: 'the people look like you. The faces, physically, they're like you!'" he added. Mr Atamian had a successful career as a film composer in Syria. But as the fighting in Aleppo worsened, he fled with his wife and young child last year. He now works as a pianist in a restaurant. Increasing numbers of ethnic Armenians from Syria are now joining him. More than 10,000 have fled here since the fighting started two years ago - and 7,000 have applied for residency. Aleppo, which is home to most of Syria's 100,000 Armenians, has seen some of the heaviest fighting. People fleeing the city say the street battles and the bombings have become too dangerous. Armenians, who are traditionally middle-class merchants, say their businesses are being ruined by the chaos of war. But when you ask Armenians which side they want to win the war in Syria, they avoid expressing support for either the rebels or the government - and tell you they only want peace. The official line of the Armenian government is neutrality. Many Armenians are terrified that relatives back in Syria will be targeted by the rebels, if the Armenian community is portrayed as pro-Assad. Others, who want to return one day, fear reprisals from the Syrian authorities if they are seen as supporting the uprising. Not far from the restaurant in central Yerevan, a class of small children are following the Syrian school curriculum, reading textbooks in Arabic. That is because this school of 300 pupils was set up specifically for the children of ethnic Armenians from Syria. Their parents hope to return with them to Syria when the fighting dies down. The children in this class are only seven or eight years old. But all of them say they have experienced war close-up, having seen bombings, gun battles, or tanks rolling down the streets. "There was a Syrian-Arab school opposite our home," remembers eight-year-old Lilit Doshokhlanian, who arrived a few months ago from Damascus. "One day tanks arrived, and there was shooting. The school was completely destroyed. So we left before my school was destroyed too." Some of the children tell me that they miss their friends back in Syria. Like all 16 teachers here, head teacher Nora Pilibbossian is also an ethnic Armenian who fled from Syria. She set up this school, with the help of the Armenian government, after she escaped from the war last summer, having noticed the thousands of families arriving. "I get so upset when I see what's going on in Syria right now. God know what's going to happen. That's where we were born, grew up and went to school. We had our homes there, and our friendships with Syrian-Arabs, who we lived and worked with. Now we've left everything behind." But the plight of those fleeing war has been eased by the welcome they have received. In Armenia, they are well aware of the parallels with events a century ago. Nora's great-grandparents, like the forefathers of most Syrian-Armenians, escaped the mass killings of hundreds of thousands of Armenians in 1915 by Ottoman Turks. They were given refuge in Syria. But today their descendants are also fleeing violence. So even though unemployment is around 20% and Armenia is desperately poor, there is no public resentment here that a wave of refugees might take scarce jobs or housing. Instead some Armenians have opened up their homes. Charities have been set up to provide clothing, and help find work and accommodation. Plus, after initially being criticised for not doing enough when the conflict first broke out, the government has eased visa and residency restrictions. "Everyone understands that they are the descendants of those Armenians who died in the genocide. We all want to do something to help," says Firdus Zakarian, from Armenia's Ministry of Diaspora. Being uprooted like your forefathers is painful. But this time round Armenians are not fleeing violence aimed specifically at them. But rather escaping a civil war, which is looking increasingly dangerous for everyone.